When you were a kid, you may have came across what is known as a bomb bag. This novelty toy has continued to be one of the most popular prank toys that exists. They are very popular with school aged children. They are very safe to use and are a great way to scare the bejeezus out of somebody. All a person has to do is squeeze the bomb bag, throw it unexpectedly to the target (usually behind their back) and they will get a good laugh when the target nearly jumps out of their pants. The target of the prank will usually be going about their normal business and suddenly hear a loud "Pop!" 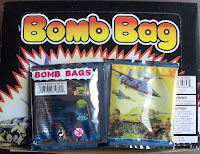 Bomb bags are simply a small 4X4 air tight foil bag that has two smaller bags inside of it. One of these smaller bags is filled with vinegar and the other with baking soda. The bomb bag will never be set off until someone squeezes the foil bag to pop open one of the smaller bags inside of it. The vinegar and baking soda will then mix together and make the foil bag expand until it cannot anymore. This is usually within five to ten seconds. Once that happens, the foil bag will explode very loud. Thus, this toy has gotten the name bomb bag. 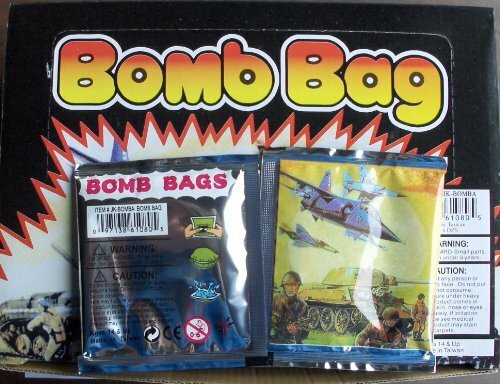 Bomb bags, just like many other old school novelty prank items are not as easy to find in your neighborhood as they once were. There may be a few retail stores in your neighborhood that sell them, but most people will usually make their purchase of this item online. If you are able to find them locally, the retailer will usually charge about one quarter for one of them. On the Internet, it is hard to find a store selling just one because it would not be worth it to anyone to pay such a large amount of shipping for just one. Instead, they will often sell one dozen or a case of 72. If someone really loves bomb bags, they will probably be better off with a case of 72 as they can go really quickly.